Monday, Oct. 29, 1888 Only 54° P.M. but very pleasant & mild. Our folks all appear as well & guess occupied much as usual. Tho' Ellery remained at home later than some mornings, & at hanging pictures in my chamber with other jobs, Charlotte out P.M. short time, but think only over at Mrs Braytons. As well self & spending day much as usual, with few extra jobs to improve appearance of chamber some. Tuesday 30 Mercury 65° P.M. & one of pleasantest days except for strong breeze from S.E. 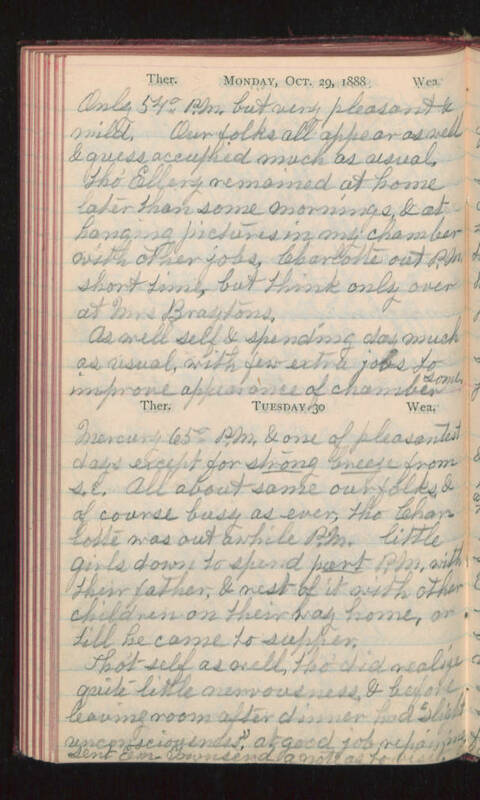 All about same our folks & of course busy as ever, tho Charlotte was out awhile P.M. little girls down to spend part P.M. with their father, & rest of it with other children on their way home, or till he came to supper. Tho't self as well, tho' did realize quite little nervousness & before leaving room after dinner had "slight unconsciousness" at good job repairing. Sent Em- Townsend a note as to visit.